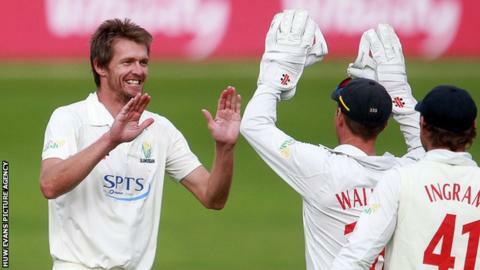 Glamorgan bowler Michael Hogan says changing weather and the bowlers being rusty were the key factors in a day of changing fortunes against Kent. The visitors reached 212-2 but folded to 309 all out on day one of the County Championship match in Cardiff. Glamorgan's inexperienced top order then stumbled to 65-4 by the close. "The conditions changed when the clouds came in, we felt it got flat at times and then it started swinging around again," Hogan told BBC Wales Sport. "We were probably rusty as a bowling unit in the first session and a half, we haven't played for a while. "But after that in the back end of the day we picked up some wickets and bowled really tightly. We're still in the game." Glamorgan had not played for more than a fortnight after sitting out the last round of Championship games and missing out on the knock-out stages of the limited-overs competitions. Hogan believes his team would have settled for Kent scoring 309 after the visitors chose to bat at the Swalec Stadium. Rob Key hit 94 while there were half-centuries for Sean Dickson, Sam Northeast and Darren Stevens before four ducks in the tail. "We were quite expensive going for four and a half runs an over for a while, so to drag that back was good work." But he acknowledges the problems at the top of the Glamorgan batting with a new combination of James Kettleborough and Jeremy Lawlor opening, and David Lloyd promoted to three. "It's tough here against the new ball, the guys we picked have done the business in the second team but hopefully they can get it right in the second innings and score some big runs," fast bowler Hogan said. "The boys (down the order) have been doing a good job, Waggy [Graham Wagg] and Craig Meschede have scored some runs and everyone's in the side to bat." Despite averaging 27 in the Championship, big-hitting Hogan says he has no ambitions to bat above number 11 - and was unable to confirm a statistician's claim that he has never been dismissed lbw in first-class cricket. "It's probably true because there's no way I get in line with the ball, but I can't be certain!" he added.